Naruru Osaka and Ruruna Kobe? Also not twins. As we usually do, we first need to set a few boundaries for what we’re talking about. There are — SURPRISE! 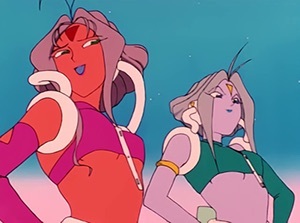 — actually very few characters within the Sailor Moon series that are explicitly stated to be twins, so I’m going to be using the term somewhat loosely here. Now that we’ve got that settled, let’s take a look at the surprisingly large number of lookalike characters! 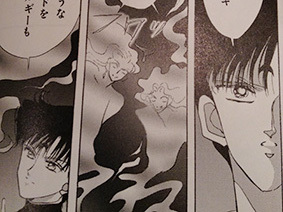 It looks like we got started early with this trend, way back in the first season of the anime with these two Youma that served under Nephrite. Named after the twin brothers of the same names from Greco-Roman mythology,1 these Youma of the Gemini constellation are also distinct in this list in that they are very obviously meant to be twins (yay!) and are unique to the anime. Most twin-characters seems to either be manga-only, or appeared in both. You could probably make strong arguments either way about whether or not this pair counts. 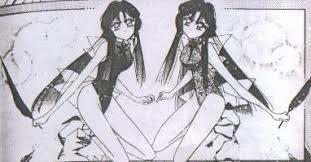 Since these two Droids (serving under Saphir) appear only in indistinct, wispy forms in the manga, it’s hard to make a judgment as to whether they’re supposed to be “twins.” However, the musical — though admittedly not the most canonical source available — depicts these Aquatici and Veneti as wearing identical outfits and with similar hairstyles, so I’m willing to say “yes” and put them here for the sake of completeness. Otherwise known as the Boule Brothers,2 these two Droids served under Esmeraude. 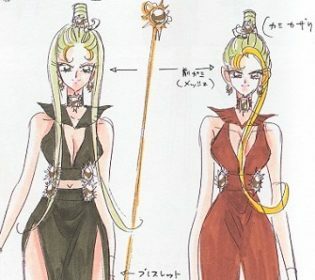 Though their mission slightly differs between the anime (to open the dark gate) and manga (to capture/kill Sailor Moon), they otherwise still worked as a pair in both series. Calling these (joint) members of the Witches 5 “twins” is a bit dishonest, since they’re actually one person (Cyprine) who splits into two (Ptilol). Though, to be fair, monozygotic twins also start as one “person” before splitting into two, so I guess it still counts.3 But this is all getting pretty far off topic. According to Ms. Takeuchi,4 Cyprine — the older of the twins — is the “face” of the two and is out in the open, while Ptilol stays back in the shadows. In Greek mythology, maenads were the female followers of Dionysus and the most significant members of the Thiasus, the god’s retinue. Their name literally translates as “raving ones”. 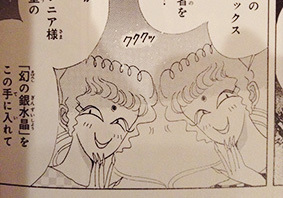 Unfortunately, the Dream arc provides almost no information about these two, so I can’t actually say much more. If anything, I’d almost be more inclined to call them clones, but that just starts getting into wild speculation territory. So, moving on! 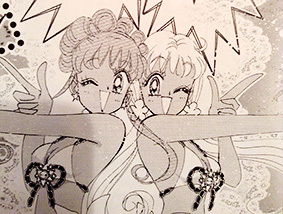 These manga-only twins, named after the minerals of the same name,6 served under the Amazoness Quartet and tried to trick Minako by setting up a fake idol competition. Masters at knife throwing, they’re some of the few Sailor Moon villains who actually seemed dangerous in a non-magical-girl kinda way. These two Lemures, serving under Hawks Eye and Tiger’s Eye respectively, may or may not actually be twins, but they do check all the other checkboxes to get them on this list: similar designs, similar names, working close together, and/or serving as a pair. In this case, they serve to represent the two sides of a seesaw and work as a duo in a circus act. I’m starting to think that Ms. Takeuchi had a pretty simple policy: if there were two characters that appeared at the same time but weren’t totally essential to the plot, they’d wind up looking identical to each other. 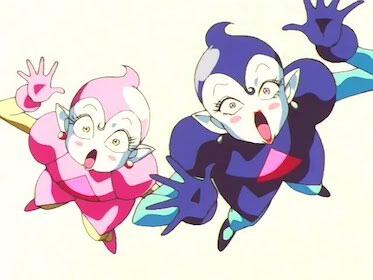 While I definitely wouldn’t consider Phobos and Deimos to be twins canonically, their designs are identical and only really differ in color (Phobos = blue; Deimos = red), so for that reason I’m throwing them in this list. 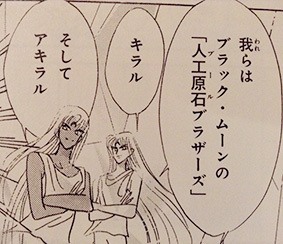 I really wish we had a chance to see these two interact with Rei in human form in the anime, but unfortunately this plot element was manga-only. These two manga-only Sailor Soldiers have always seemed to be really popular among the fans, and I can definitely see why. Though they only appeared in one act of the manga, you learn a lot about their back story and feel like you can understand them. The two come from a single planet which was apparently very poor and always at war. After Galaxia destroys their planet, they wind up joining the Shadow Galactica, thinking this is the only chance they have for peace. 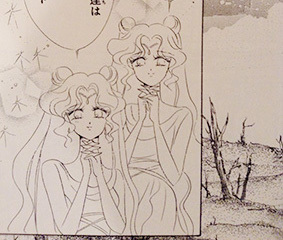 What makes these twin sisters memorable, though, is that they redeem themselves at the end (thanks to Sailor Mnemosyne’s impassioned pleas to her sister to stop fighting Sailor Moon). For two characters that only appear on a few pages, it feels like they have their own story arc! Serving as the last line of defense between the (good) Sailor Soldiers and the Galactica Palace, these manga-only characters are arguably some of the most powerful villains in the series. In addition to killing Sailor Mnemosyne and Sailor Lethe, they also managed to wipe out the Sailor Starlights and Sailor Kakyuu. I mean, I understand Taiki, but did the other Starlights deserve that fate?? As an aside, am I the only one who finds it weird that Star Gardeners walk around in fashionable brand clothes and high heels? Gardening star seeds must be an entirely different type of work than I’m imagining. 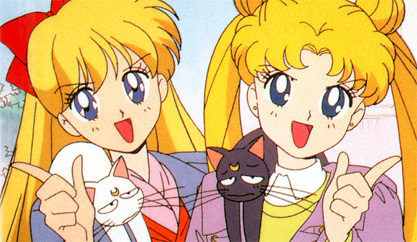 Okay, so maybe Minako and Usagi ARE twins? So there you have it, a list of all of the twin (or twin-like) characters to appear throughout the run of the Sailor Moon series! I’m pretty sure this is a question no one ever really wanted to know the answer to, so just think of it like a “freebie,” if that helps. As for why there were so many lookalike characters in the manga, my gut instinct is that it simply had to do with the amount of time and effort involved in designing characters. For non-recurring characters who weren’t too essential to the plot, it just made a lot of sense for Ms. Takeuchi to reuse the design. This makes sense from a reader/viewer’s perspective, too, since it makes it clear to the reader that these two are a “team” without having to explain it to the leader. Is there anyone else you’d include in this list? 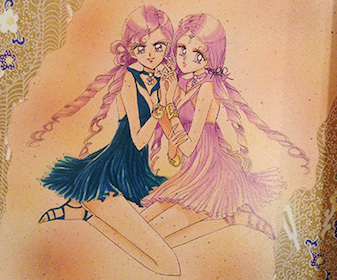 Maybe Ruruna and Naruru (of ChibiUsa’s Picture Diary)? Queen Serenity and Princess Serenity are an obvious one as well. 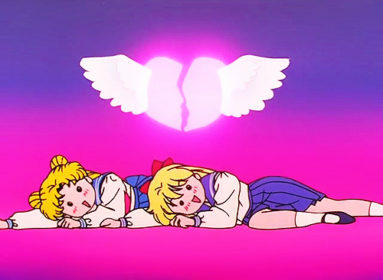 Minako and Usagi?? ← How Similar Is the Sailor Moon World to the Actual Azabu-Juban? What about the lemures Gittanko and Bakkonko the see-shaw girls? You’re absolutely right! The article has been updated. Thanks! 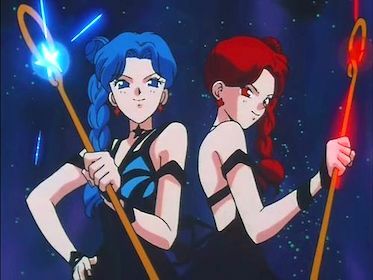 I know that Palla Palla is the most loved counter part to sailor mercury blue themed villian but, Cyprine was my favorite of the witches. I’d love to read an analysis on her and her twin Ptilol! You are doing a hero’s work with this website. I didn’t know this is a question I needed answered until I found this article, but once I did I thought back to all the twins I remembered seeing throughout the manga and just HAD to know the answer.